Hanging Heaton inflicted a four-wicket defeat on JCT600 Bradford League Division One champions Cleckheaton last Saturday. The Moorenders appeared on course for a big score when opener Andrew Gorrod and John Wood both hit half centuries. Wood survived a huge lbw appeal from Dan Busfield first ball but went on to crack seven fours and two sixes in his 50 before falling to the impressive David Stiff, who finished with 4-21 from 12 overs. Busfield returned to wrap up the Cleckheaton innings as he finished with 6-60 and the visitors were dismissed for 177. Heaton lost captain Gary Fellows to the first ball of their reply but recovered to secure the victory with Nick Connolly (56) and Ben Elvidge (45no) leading the way. Woodlands maintained their hold on second place with an emphatic nine-wicket win over Undercliffe. Impressive bowling from Woodlands captain Pieter Swanepoel (6-40) saw last season’s Division Two champions dismissed for 128. Opener Sam Frankland guided Woodlands to their modest victory target with an unbeaten 63 which included 11 fours. 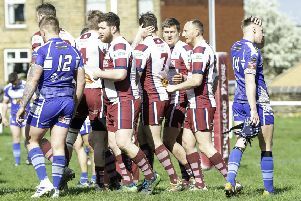 Woodlands trail leaders Pudsey St Lawrence by 27 points after the Saints’ hard-fought 14-run victory over Bradford and Bingley, while Heaton moved up to third, a further 14 points behind. St Lawrence were restricted to 199-9, with Mark Robertshaw (43) top scoring and Jack Hartley claiming 3-40. Noman Ali replied with 48 for Bingley, while Hartley made 27 not out but they were bowled out for 185 as Thomas Hudson claimed 5-50. East Bierley suffered a 75-run defeat to Lightcliffe and slipped to ninth place. Lightcliffe overseas player Suleman Khan (63) and captain Alex Stead (45) led the way as they posted a useful 218-7. Gavin Hamilton top scored with 37 in Bierley’s reply but they were undone by Yorkshire paceman Mohin Ashraf, who claimed 5-18, as the home side were dismissed for 143.